Whether you upgraded to Windows 8.1 right away after its official release or you’ve waited until now, you may encounter some Internet issues after going forward with the upgrade. Even now, months after its official release, the Windows 8.1 upgrade still isn’t a smooth process for most users. That’s why we’re here to help. Crippling Internet issues have plagued users who’ve upgraded to Windows 8.1, and we have compiled some tips for handling them and to get you back on the Web in no time. First, We recommend following these steps to troubleshoot the Internet connectivity problems after your upgrade to Windows 8.1. 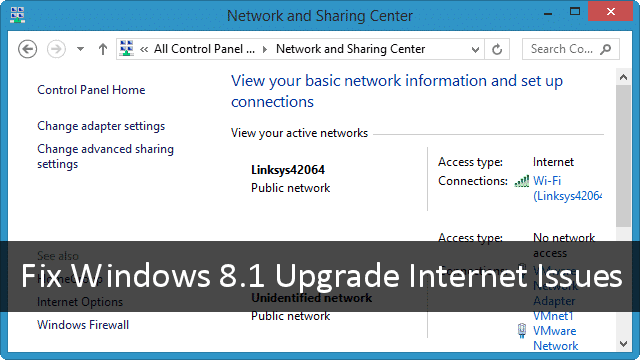 The most common issue after upgrading to Windows 8.1 is that your computer connects to your home or office network, but the router doesn’t assign a valid IP address for you to use. This causes you to have a limited connection to the Web, which is useless for you and your computer. Microsoft has yet to address this issue officially and often rambles off on some very basic ways to fix it with only lead to more frustration for users. After upgrading, we recommend you restart your computer. This isn’t just a good idea for connecting to the Internet, it helps to give you PC a brief respite from the long upgrade process. In most cases, this will eliminate Internet issues you’re having immediately following the upgrade. This may work on some non-Internet related issues, too, so always remember to reboot your PC after upgrading to Windows 8.1 regardless of the issues you’re having. If restarting your PC didn’t work, the next step will be to power cycle your home or office network. Turn off your PC first. Then, unplug your modem and router. Keep them off for at least 90 seconds, then first plug back in the modem and let that boot up. Once booted up completely, then plug in your router. Once that’s finished powering on, turn on your PC and let it acquire the network address and see if that made a difference. This is often the next most common thing to fixing any issue on a PC, especially if your Web connection is sluggish and running slow. If this doesn’t work, there’s some sort of hardware, software or driver issue. If power cycling your network fails, check your anti-virus software to make sure it’s not conflicting with anything in the new Windows 8.1 update. Some users have reported that Norton’s firewall in particular conflicts with the firewall in Windows 8.1. We recommend disabling anti-virus, restarting your PC, and seeing if that corrects the issue. If it does, you may need to be on the lookout for a new anti-virus program, like Avira or Baidu. Some anti-virus programs just conflict with the Internet. It’s not the computer itself, it’s how it interacts with other software on your system that causes an issue. For some users, they’ve found that their wireless adapter is being disabled for some reason during the upgrade process. If this is the case, re-enabling it will fix the Internet issue completely and immediately connect you back to your network if the name and password haven’t changed. There’s no telling why Microsoft disables the wireless adapter during the upgrade process and why it only happens to some PC users and not others. Again, no word from Microsoft on this issue with the upgrade to Windows 8.1. If you’re still having issues and your anti-virus program is working properly, check to see if your wireless adapter needs updating. There have been conflicting reports that some wireless adapters, and other hardware, needed driver updates specific to Windows 8 and Windows 8.1 in order to work properly after the upgrade. If your hardware manufacturer hasn’t released an update yet, you may be out of luck for the time being but we do recommend following the next step. 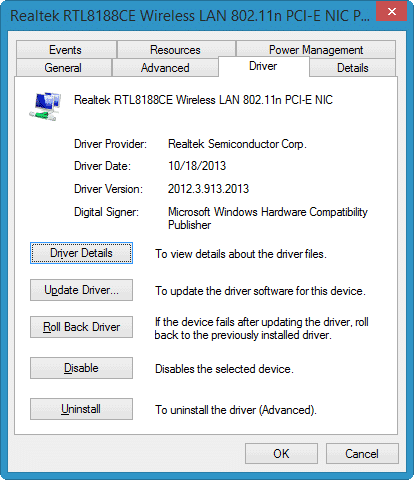 If your drivers aren’t in need of an update or that doesn’t work, try reverting your driver to a previously version. If you have two of the same driver for a wireless driver, try switching between the two to see if this helps. This has been a common tactic for Windows users since XP and has been effective dealing with this issue in Windows 8.1. If you’ve exhausted all the above options and are still having issues with the Internet after upgrading to Windows 8.1, it may be possible you have some sort of driver, patch or software conflict blocking you from using the Web. In this case, the best solution is to do a clean install of Windows 8, then upgrading to Windows 8.1. While is by no means the best solution, it has been proven to fix the issue in its entirely when you can’t narrow down why your internet access isn’t working. Microsoft was never able to identify why users experience Internet issues after upgrading. For one user, one solution might work; for another, a different solution might do the trick. We recommend following the steps above one-by-one and if they don’t work, it may be time to call Microsoft or post this issue in the Microsoft Forums and inquire for more specialized help with getting back on the Web after upgrading to Windows 8.1. Don’t fret if your Internet doesn’t work after upgrading Windows 8.1, with some of the above solutions, you’ll solve the issue in no time.